In this day and age of relentless communication, we have had to have a long think about what we will use for keeping in touch when we are away in Africa. The obvious choice is the humble mobile/cell phone. There are a number ways these can be used, but by far the cheapest is to purchase a prepaid SIM card in each country that you want to use it in. Obviously the phone would need to be unlocked, so it will accept SIM cards of all networks. And coverage for mobile phones in many places in Africa is surprisingly good. It’s far easier to install a mobile network in an emerging Country, than to start to think about a land line type system. Prepaid SIM’s in many African Countries work out much cheaper than the equivalent card supplied by a European provider. The obvious downside to a Cell phone is the probability that the one time you need it, there’s no signal! The alternative is a hand-held Satellite Phone. There are quite a few options on the market today, not just with the actual handsets but also the satellite networks. At the moment, the company that seems to operate the most reliable phone connection is Iridium. The Iridium system uses 66no low orbiting satellites operating at 485 miles from Earth. By contrast, the rival Inmarsat system only uses 3no satellites but these are 22,000 miles from Earth. But the main difference is that the Iridium satellites are whizzing round the earth at very high-speed, hopefully ensuring that as one is disappearing from overhead, the next has already appeared! Whereas the Inmarsat satellites are in a fixed orbit, one over Central America, one over South East Asia, and one over the DRC in Central Africa. This means that the Inmarsat system works better the nearer you are to the equator (more on this below). So we have decided to buy an Iridium Hand held Sat Phone as this will be the most versatile and hopefully will prove reliable when we need it. Indeed it is the only system with truly global coverage. Obviously we will want to regularly up date our blog! So what are the options? Obviously, when available we will use Internet cafes, and WiFi. However this is not going to be readily available in the “interesting” places. One option is just to use the Sat Phone as a Modem, this will be extremely slow (maximum of 2.4kbps) and not very cost effective. Another is to use local Data SIM cards in a Dongle, again slow and very hit and miss. The other option is to use a BGAN terminal, (Broadband Global Area Network) these use the Inmarsat system (so good coverage over Africa), and offer Broadband speeds anywhere that there is a clear line of sight to the satellite (the nearer to the equator, the easier this is to do as the satellite is basically right overhead). The main down side to these units is the cost, the terminal units are over £2,500.00. This was clearly not an option. But Ebay is a wonderful thing! I found a second hand unit on there, which had just gone on the site. After a long phone call to the Seller a price was agreed, and I drove up to Silverstone to inspect it and pay for it. The unit is a Thrane and Thrane Explorer 500 set, it was complete with charger, 2no phone hand sets ( as it can also be used for calls), various accessories and complete in a custom-made Pelican case. Altogether about £3.5k worth new, obviously I only paid a fraction of that. When first set up, I checked the historic log and found it had only been used about half a dozen times, all in South America. We did however had to purchase a new rechargeable battery for it as it had been standing in a discharged state for too long. 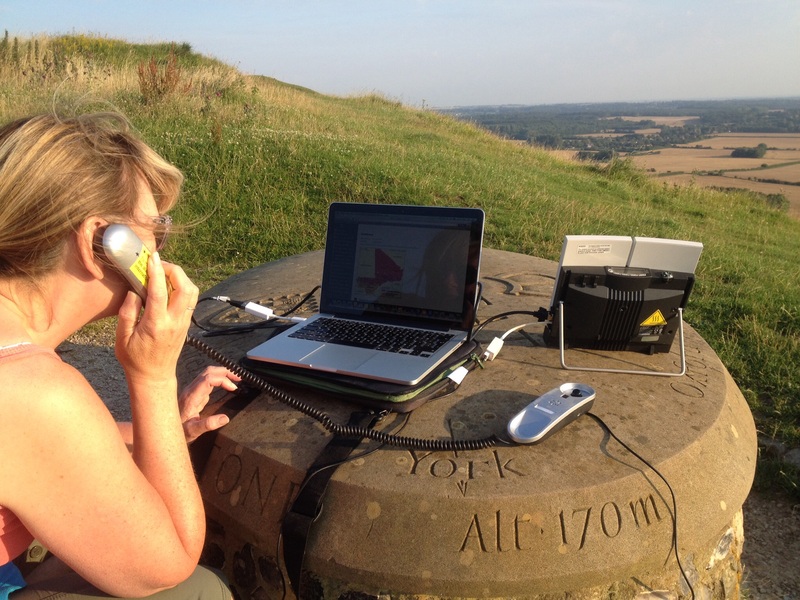 Using the BGAN is simplicity itself, you simply angle the unit towards the satellite using the build in compass and the audible beeps, until a strong signal is received, then plug it into your laptop, and instantly you are connected to Broadband. Speeds are 348kbps to receive data, and 240kbps to send data. It can be used for calls but it’s not something that can be carried around very easily. The unit itself is 220mm high and 170mm wide, and weighs 1.4kg, so not huge but not something you want to be lugging about with you, when out and about. You can see the size of the Explorer 500 on the right hand side. You can also see the hand set that came with this particular unit. There are more up to date units on the market now, that are faster, but these are well out of our price range and the Explorer 500 is proven in the field, and is perfect for what we want from it. With the hand-held on Iridium, and the BGAN on Inmarsat, it means that we are not tied to one operator, and if there is a problem on one we can hopefully still use the other. So hopefully we be able to stay in touch via phone calls, text messages, email, blog, and social media. So much for getting away from it all for a couple of years!! !